With a flexible spine and feet like tire treads, the cheetah is built not only for speed, but for unrivaled acceleration. The cheetah leaves even supercars in the dust, going from zero to 60 in just three seconds. 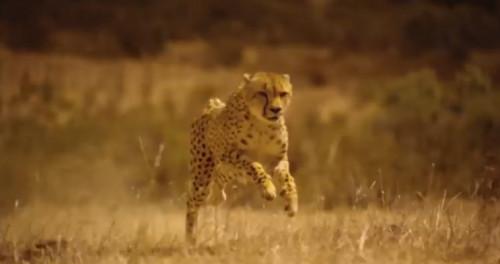 The cheetah moves so fast that its feet spend more time in the air than on the ground with a double-suspension stride. The cheetah’s tail works like a rudder, coupled with its non-retracting claws for amazing agility in sharp turns. Nope, you aren’t going to outrun a cheetah. This entry was posted in Animal Facts, Animal Videos and tagged Big Cats, Cats, Cheetahs, Wild Animals, Wildlife by animalpages.Bookmark the permalink.